pre-owned and then give passing or a failing mark according to my standards. 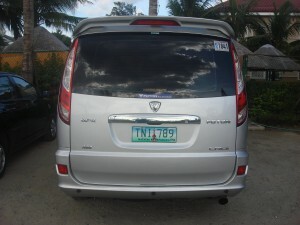 my first auto to blog is the Foton MPX which i borrowed from the Consultant of Foton Motor Philippines, Vincent Licup. Sigh! 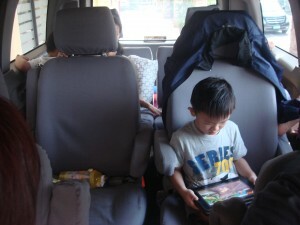 What a relief, the Foton MP-X surely gave us the space we wanted. 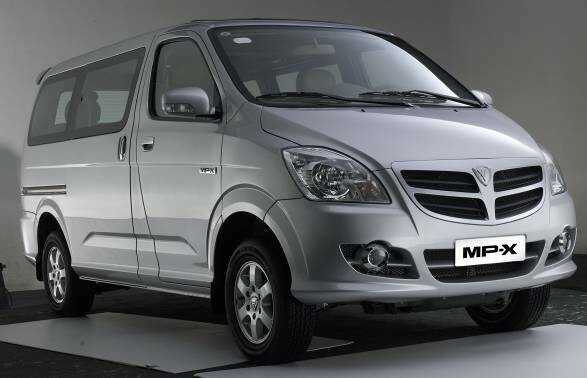 The Foton MP-X is China’s affordable answer to Koreas Grand Starex. The full size van definitely answered our problem with space because we wanted to surprise our eldest son Raja and we need to bring the bike he wanted for Christmas, not just bring but to hide it until Christmas day. We are a family of 4, 2 adults, 1 4 yr old, 1 baby. 1 yaya to help us with the kids and tons of Christmas Gifts! It all fitted in! and its hard for us to listen to our conversations due to the noisy engine. The last time i drove a CRDI was with a BMW 5 series, it was the complete opposite; quiet and super responsive. Some forums that i have read questioned the authenticity of its CRDI because of the Torque and HP rating. Some said it is the Isuzu engine for Mu and Fuego of the 1990s. I hope someone can confirm this issue. The instrument panel also failed my criteria, according to my Audi training before, instrument panels should be in amber or red, because this prevent drivers from accident because of its bright and attentive color, the van has green. The temperature LED is annoying because it is lit all day, its just confusing. On the middle, they have the drawing of a moving van which is unnecessary with the indicator of the outside temperature which they can put somewhere else and they can just remove the middle cluster. The aircon switches is also confusing because they are using an amber color for “ON” which in general is “STOP” or “ATTENTION” so it kept me guessing if the button is to turn on or off. 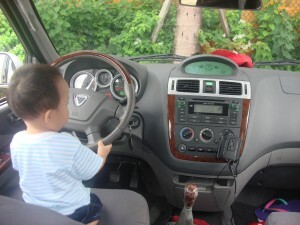 I also had a hard time looking for gas lever which is located under the driver’s seat far right? It should be placed near the hood’s lever or somewhere near the driver side door. The rear door makes it impossible for a Mommy to close it because it opens very high which is hard to reach for an average Pinay Mom and Mommies should be a weightlifter because the suspended door is heavy. Even though i have a lot of criticism on the interior, the suspension and the ride was excellent. You’ll know because the kids were sound asleep during the long drive, they hardly felt the bumps and the turns. That’s crucial on a van! Some vans are really shaky and bumpy, have you tried riding those GT express’? You’ll know what i mean. The air-con is also above average, with the scorching heat, it gave the cool breeze and the kids never complained at all. Over all, the MP-X fulfilled our travelling plan. The engine responded well even complimenting on its excellent diesel consumption. The leather interior and its roomy cabin saved our space issue, the air-con also performed even on extreme heat. What else to ask for a little over a million pesos P1.150M). If you have a big family but has budget issues, this Van is perfect for you. They have Low downpayment schemes that will surely fit your budget. It is still far better and safer compared to the converted vans coming out from Cagayan Valley with plate prefixes of “B”. Let us all remember that China is no longer a sleeping dragon, improvements on their vehicles will be very fast because they have the money, they have been buying European and American car companies to be able to compete with the best. And with the Sytin brothers as the dealer principal here in the Philippines, Foton brand will surely be a hit in the years to come. Insurance Premium: 29,000 with acts of nature. For sales inquiries, you may contact Jun Dizon at 4424076 or 4424077.